Impress your next SEO Client with Live Stats & Analysis! Website SEO Checks Lite is a quick and easy all-in-one tool to do many of the checks, and lookup many of the stats, that you will want for basic SEO Analysis. 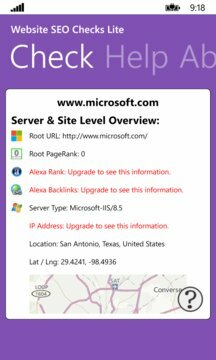 The app does not list the search rankings, that some other apps concentrate on, but goes more in depth, looking at the server, the website and the individual page in question. 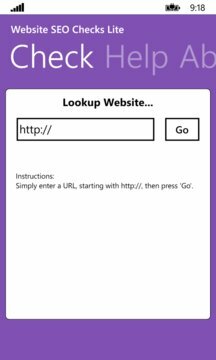 For the full version, search for "Website SEO Checks" in the Windows Phone Store, or go to the Upgrade page of this app.